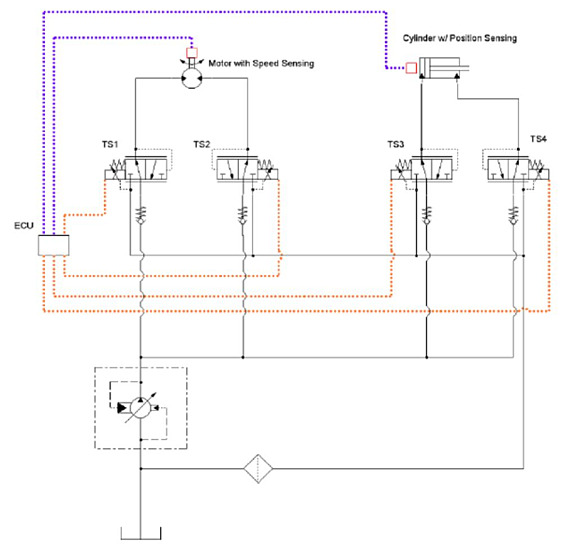 Basically this type of control scheme modulates the pressure differential across a hydraulic actuator as a means to control function speed and direction (and even position). Since loads on most actuators are rarely constant for any specific speed how is it possible to get adequate control using pressure alone? The answer is, by applying closed loop electronic control. What this involves is adding position or speed sensor feedback to each actuator. This feedback information is processed by a Programmable Electronic Control Unit (ECU) which in turn applies the appropriate current to the valve coils to achieve the desired output speed, direction or position. The valves are typically going to be proportional pressure reducing/relieving valves but proportional reliefs can sometimes be used (as in a function that relies entirely on gravity). Greatly reduced valve count in most applications. Better Energy management - reduced heat generation, lower fuel consumption and battery discharge rate. Pressure control valves have better frequency response than directional control valves. Counterbalance valves are no longer required to control overrunning loads (though static load holding will require some additional valves). Load Sensing pump can be controlled electronically eliminating the need for load for a load sense network. As you can see there is a substantial reduction in the number of valves needed to do the same job. Using the feedback from each sensor on the actuators, the ECU can independently and precisely control the pressure at both ports of each actuator. This control allows for a very high level of motion control over each function, enabling this simple circuit to have complete control over speed, direction, position, acceleration and deceleration. It can also allow all these parameters to be varied in real time according to the demands of the machine. For example you could control the reducing/relieving valve on the return side of the lift cylinder of a boom function as it goes over center to prevent run away. This eliminates the need for counterbalance valves. Another example is controlling the positioning of a cylinder in a piece or processing equipment. By regulating the pressure appropriately on both sides of the cylinder it can be extended or retracted to any position and held there. 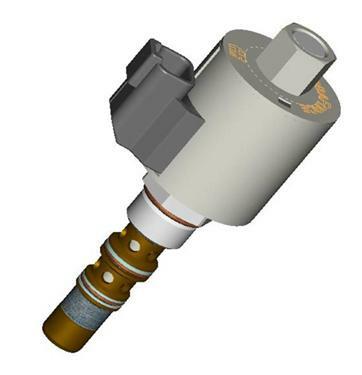 Additionally, because the proportional pressure control valves provide a pressure signal proportional to the command input this allows Electronic Load Sensing to be accomplished without pressure transducers. So while a pressure control system does need position or velocity sensing it does not need additional pressure sensing to accomplish electronic load sensing. Because you have complete control over pressures and the ECU knows the position, speed or both for each actuator many compromises in tradition controls can be eliminated. For instance since counterbalance valves are usually only needed for the part of an operation that requires overrunning load control and waste energy the rest of the time. 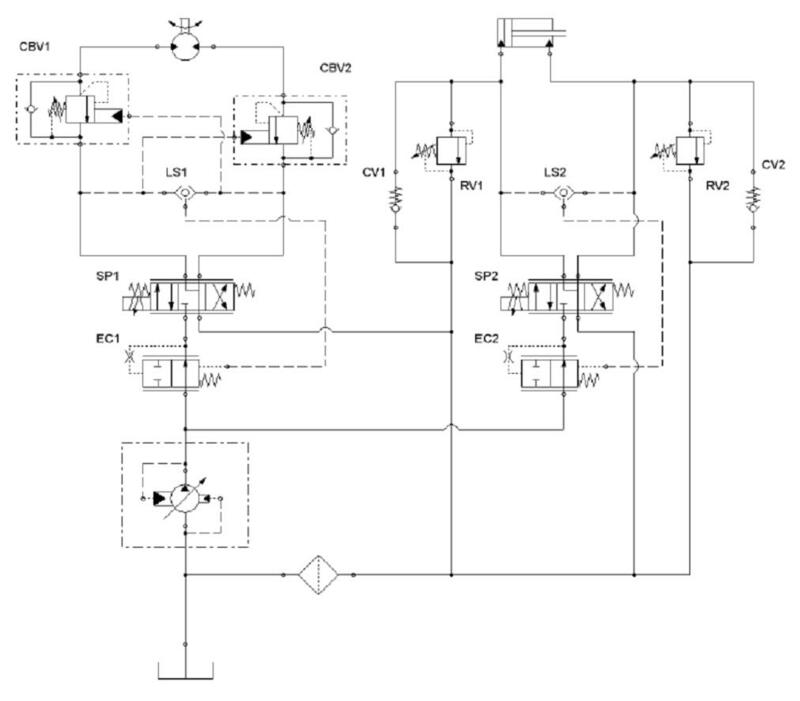 Using pressure control overrunning load control can be programmed to be active only when it is required. Yes it is true that many if not all of the advantages I have mentioned can be achieved with tradition proportional direction control. The difference is that once you go pressure control these are all available with out any additional components.